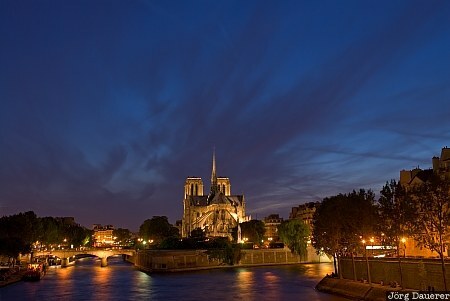 The floodlit cathedral of Notre Dame de Paris on the Ile de la Cite and the river Seine at the blue hour seen from Pont de la Toumelle in downtown Paris, Ile De France, France. This photo was taken in the evening of a sunny day in June of 2008. This photo was the image of the month in September of 2010. This photo was taken with a digital camera.